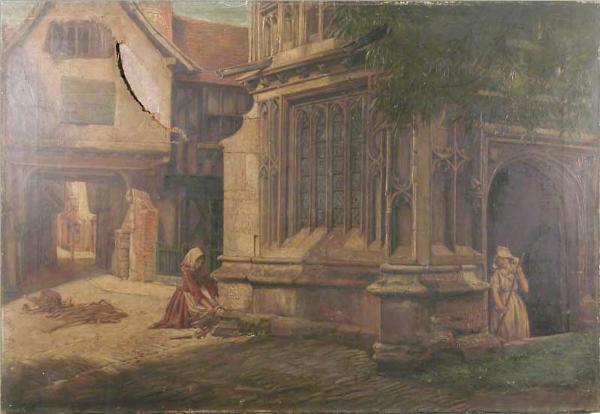 This painting was offered for auction at Gorringe’s in Lewes, East Sussex, under the title Maids beside a church doorway, on 22 July 2004, with an estimated price of £800-£1200, but was not sold. It was offered again by the same auction house on 7 September 2004, and sold for £280. Mr. Eyre Crowe’s Old Porch, Evesham (11), a study, with figures, of the well-known entrance to the church at Evesham, can boast of careful and solid painting of the Gothic stonework, and is rather richer in tone than is usual with Mr. Crowe; but it is deficient in brilliancy and clearness, qualities essential to architecture in sunlight.